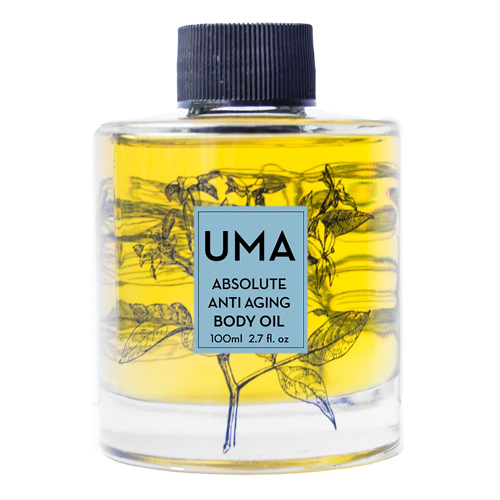 Absolute Anti Aging Body Oil by UMA Oils is bursting with beneficial ingredients to boost a look of youthfulness and visibly firm the skin. Ideal for all skin types, it’s a multipurpose oil that leaves skin feeling super soft with a radiant looking glow. Rich yet lightweight, this body oil is formulated with deliriously aromatic oils of sandalwood, neroli, frankincense and lavender. The potent blend of all-organic, single estate-grown oils were chosen specifically for antioxidant properties, while visibly improving firmness and making skin feel silky smooth. Massage into skin as needed. This oil layers beautifully with your favorite skin care regimen, and can be applied throughout the day. The scent of this oil is heavenly and the oil itself makes your skin so happy...moisturized, smooth and yummy! A holy grail product for sure. Sinks into the skin perfectly and eliminates the need for perfume. I love love love it and I'm sure you will too!